The third week of the Giro d’Italia is simply brutal for the sprinters who have very little to aim for and have to fight hard almost every day just to make it to the finish within the time limit. To make things worse, they may have to wait all the way to the final stage in Milan to get a final chance to show their fast legs unless they can control what will be a short and very aggressive ride to Lugano tomorrow. A few years ago, the final week of the Giro d’Italia included no sprint stages and gave the sprinters very little incentive to get through the massive amount of climbing in the final part. This year the third week is again loaded with big mountain stages but the organizers have followed the recent trend of including a few opportunities for the fast men and allowing the GC riders to get a small breather. This year the final week has two chances for the sprinters and the first of those comes on stage 17. The course brings the riders over just 134km from Tirano to Lugano for a finish in Switzerland just across the border. The stage will partly allow the riders to regain their strength. It is most suitable to sprinters, but it is not completely flat. The only KOM climb of the stage is just after the start, with the Teglio ascent (category 3, 7.4km, 6.5%, max. 10%). The Valtellina scenic route runs across Poggiridenti and leads to Sondrio. Here the stage course enters the Adda River valley and runs along it until it reaches the mouth of Lake Como. The roadway narrows all along the lakefront road leading to the short Croce di Menaggio climb (2.8km, 6.4%) whose summit is located with 25.1km to go. The following stretch of road leading to Lake Como has a few tunnels along the route. The last 3 km run across the urban area of Lugano. The riders will have to watch out for a number of obstacles, such as roundabouts, speed bumps and traffic dividers, while crossing urban areas. In the finale, there is a small climb which summits with a round 4km to go. The last kilometres run initially downhill (with two close hairpin bends 3 km before the finish), then along the shores of Lake Lugano for the final 2 flat kilometres, on well-paved roads. There are sharp turns with 2.5km and 1km to go. The route features one last bend 750m from the finish, on 7-m wide asphalt road. Lugano has hosted a stage finish twice in the past, most recently in 1997 when Serguei Honchar won the stage. It was a rainy second week but it seems that the sun will return for the final part of the race. Tomorrow is forecasted to be a sunny day with a maximum temperature in Lugano of 20 degrees. That will be a pleasant contract to what the riders experienced a few days ago. There will be a light wind from a northerly direction. This means that the riders will have a crosswind for most of the day, with just a short tailwind section along the Lake Como at the midpoint. In the finale, there will be a crosswind for most of the time, apart from a short headwind section just before the 2km to go mark. In the final kilometre, the riders will mainly have a tailwind. For three days, the Giro d’Italia has been all about the GC battle and the final week doesn’t leave the overall contenders much room to recover. Only two stages seem destined to be the scene of a ceasefire between Astana and Alberto Contador. Apart from the final stage into Milan, the only chance to breathe comes tomorrow in the short stage to Lugano where only bad luck like the crash that split the field in Jesolo, will create differences in the top end of the overall standings. That doesn’t mean that they will get an easy day in the saddle. For riders that are not climbers or sprinters, this is the final chance to win a stage and so almost the entire peloton have red-circled this day as an opportunity to go on the attack. At the same time, the sprinters have been looking forward to this stage ever since that rainy day in Jesolo as what could be a chance to stretch their legs one final time before the big final sprint in Milan. This should set the scene for a very exciting battle between a breakaway and the sprint teams. However, it won’t be an easy feat for the sprint teams to set up a bunch kick in Lugano. Most of the course may be flat but the tough start to the race and the short distance is likely to tip the balance in favour of the escapees. The first climb is really tough and none of those teams will be strong enough to control the many attacks on that ascent. They can do nothing but close their eyes and hope that the break won’t be too strong or too big. However, on this kind of climb the strong riders will simply ride away from the bunch – especially this late in a grand tour – and so there is no doubt that it will be a very strong break that gets clear after what will be a very fast start to the stage. Furthermore, the brisk pace on the climb will probably be too much for the sprinters and their domestiques who could find themselves in groups further back by the time the break has taken off. When the group goes clear, the pace will go down and this will allow a regrouping to take place. There is no doubt that the sprinters will rejoin the peloton but before that happens, the break may have built a considerable advantage. By the time the chase gets organized, we could find ourselves at the halfway point in this very short stage and over such a distance, the escapees won’t be too fatigued. To make things worse, there’s that tough little climb with 25km to go where the break can gain more time and there’s another climb in the finale which may be used for a late attack even if the peloton manages to catch the early break. It will require a massive effort from the five main sprint teams to bring it back together for a sprint. Unless Sky commit fully to the task, we don’t think that it will be possible and so we expect this stage to be one for an early break to battle it out for the win. It should be noted that we can expect a battle for the mountains jersey on the first climb. Today Steven Kruijswijk took the blue jersey but Benat Intxausti will be keen to take it back. He can do so by winning the KOM sprint and so should be active on the first climb. This could allow him to make it into the day's break but if the escape has still not gone clear, he will probably slow back to save some energy for days that have more points on offer. It won’t be possible for every rider to win this stage from a breakaway. To get into the break, one has to be relatively fresh at this late point in the race and has to be a very good climber to get into the break in such a tough start. The break won’t necessarily get clear on the climb but to have a chance to join the break on the subsequent descent or the flat part, one has to be good enough to get over the climbs with lots of power left. Finally, one has to be good enough to finish it off in the lumpy finale which means that a good sprint is a big advantage. Philippe Gilbert has already won a stage and since he hasn’t left the race to prepare for the Tour de France, he must be optimistic that there could be more in store for him. This stage is probably his final opportunity so there is no doubt that he will be very eager to escape. Going into the race, Gilbert was still suffering from his Fleche Wallonne crash but he has been riding at a high level throughout the entire race. When he won the stage of Monte Berico, he was even reminiscent of his former self and he seems to still be relatively fresh. The first climb may be a bit too hard for him to follow the best but as the strongest climbers will prefer to save energy to the mountain stages, there is a big chance that he will be good enough to join the break, especially if it gets clear in the flat section. Furthermore, BMC is part of a very strong BMC team and he could even have a teammate like Amael Moinard, Darwin Atapuma or an in-form Silvan Dillier at his side. This will make things much easier to handle in the finale. It is hard to imagine that he won’t be the fastest rider in the group and so he will be heavily marked. With a teammate to control the situation, he can bring it back together for a sprint from the breakaway and then it is hard to imagine that anyone will be able to beat him. Even if he doesn’t make the break and it is brought back together, he may try an attack on the late climb, giving his two opportunities to win this stage. Enrico Battaglin has won stages in this race two years in a row but this year his account is still empty. His two only real opportunities to win a stage come in stages 17 and 18 so he will be fired up to get into the break tomorrow. For the second year in a row, he has been riding poorly all year and been at a bad level at the start of the Giro. However, he has again ridden himself into some good form and for the first time this year he was climbing at his usual level when he sprinted to fifth on the Monte Berico. This suggests that he is strong enough to join the right break in this tough opening phase and with his fast sprint he will be hard to beat in this kind of finish. Francesco Gavazzi has been riding really well in this race but his efforts have been unrewarded. He has been in contention in the harder sprint stages and was unfortunate to be taken out by a crash in the Monte Berico stage which was probably his best opportunity. In stage 15, he was riding strongly to make it into the break on a day which should actually have been too hard for him. This terrain is much more suited to his skills as it has a similarly tough start where he can make it into the break. They lumpy finale is tailor-made for a rider with a fast sprint like the Southeast rider. If it comes down to a sprint, we should be in for another battle between Giacomo Nizzolo, Sacha Modolo and Elia Viviani. Until now, Nizzolo and Modolo have been very evenly matched. While the Trek rider seems to be slightly faster, the Lampre-Merida sprinter has benefited from having the strongest lead-out in the race. This finale is a bit more straightforward than the one we had in Jesolo. There won’t be wet roads and the final bend comes with 750m to go. This makes it less about positioning and lead-outs and more about speed. Furthermore, it will be important to be a good climber not to lose too many positions on the small ascent in the finale and be relatively fresh after what will have been a very hard day. Nizzolo and Modolo are both climbing well and both seem to still be recovering in a good way. Both have great teams to support them and should be able to start the sprint from a good position. In Jesolo, Modolo won the sprint by swerving slightly to the right. Otherwise he would probably have been beaten by Nizzolo who has been the fastest in their previous sprints. With a longer finishing straight, Nizzolo should have the upper hand and so he will be our favourite if it comes down to a sprint. However, another win for Modolo is definitely also possible. Already from the very beginning of this race, it was evident that Lampre-Merida have the best lead-out train in this race. They have simply nailed it in every single sprint in this race and there is simply no sprint in which Maximilano Richeze has not been the final lead-out man to swing off after having been delivered in the perfect position by Roberto Ferrari. Even in the sprint for fifth in stage 10 and in the uphill sprint on stage 7, the pair did everything right to position Modolo well. In stage 2, the Italian sprinter was almost pushed into the barriers by Nizzolo, in stage 6 André Greipel was simple faster, in stage 7 he ran out of legs, in stage 10 he was narrowly edged out be Nizzolo and in stage 13 he took the stage win. Modolo has been up there every time due to the excellent lead-out efforts by Ferrari and Richeze. Lead-outs may not be of utmost importance in this less technical sprint but in this kind of level sprinting field, it is still a significant factor. Furthermore, Modolo still seems to be very fresh and is good at overcoming climbs and this makes him suited to this stage. Elia Viviani has not had much support in the sprints but now things are likely to change for the Italian. Leopold König is still in top 5 contention but unlike Richie Porte he is not a potential winner of the race. For Sky, the points jersey and another stage is now very important and so Viviani can expect to be fully supported by the likes of Salvatore Puccio and Bernhard Eisel in the finale. However, he still doesn’t have the kind of lead-out that Nizzolo and Modolo have and even though he is probably the fastest on paper, he hasn’t had the speed to beat his compatriots in recent sprint. On the other hand, better team support may allow him to be a bit fresher at the finish and this could possibly allow him to turn his fortunes. Luka Mezgec has not had an awful lot of success but things may change in the final week. This is his third grand tour and he has always been at his best in the final week. It is no coincidence that he has always been very strong in the sprint on the final day. This year he is again riding very well this late in the race and he was even close to making it to the top with the best of the brutally steep Crosara climb in stage 12. Compared to his rival sprinters, he will probably be a bit fresher at the finish after what will be a very hard and fast day and this could make it possible for him to finally take that elusive stage victory. Trek will do their utmost to set things up for a sprint finish for Nizzolo but in this kind of hectic opening, they may prefer to send a rider on the attack to keep their stage winning opportunities alive. The only rider in the team who can escape in this kind of tough start is Fabio Felline. However, the Italian is really an excellent card in this kind of stage and if he hadn’t been a Trek rider, he would probably have topped our list of favourites. Felline has been riding really well all year and his performance in the stage to Madonna di Campiglio indicates that he is still very fresh and strong. This stage is simply tailor-made for him as he is strong enough to make it into the break and very fast in a sprint if a small escape group arrives at the finish. Grega Bole is known as a sprinter but he knows that he won’t win a full-on bunch sprint against the likes of Nizzolo, Viviani and Modolo. However, he is a much better climber than his rival sprinters. In fact he even finished 35th in the the Madonna di Campiglio stage, just 8 minutes behind Mikel Landa. The Slovenian may not be the one to attack on the climb but if the break gets clear after the summit, he will be strong enough to join the action. In that case, he is obviously fast enough to win the stage. The Ag2r duo of Matteo Montaguti and Rinaldo Nocentini have made very different performances in this race. While the former has been in several breakaways, the latter has been far from his best level. However, he has now found his legs and Montaguti is still riding very well. Ag2r have no sprinter or GC rider so they will do their utmost to be part of the action. Their two Italians have the skills to attack in this kind of tough finale and both have the fast sprint and explosiveness that is needed for the finale. The Katusha duo of Pavel Kochetkov and Sergey Lagutin have both been riding well in this race. None of them are strong enough to win the big mountain stages but they can do well in this kind of terrain. Both are reasonably fast in a sprint – especially Lagutin – and they seem to have maintained their condition at this late point in the race. Katusha have been riding aggressively in this race and there is no reason that the swill change that approach tomorrow. Astana will probably save their energy for the mountains but they may prefer to send a rider on the attack to defend their lead in the teams classification. The climbers will be asked to take it easy so this could open the door for Luis Leon Sanchez to chase some personal success. Due to his domestique duties, he has been riding rather anonymously but his second place in the time trial proves that his condition is great. This stage suits him very well as he is a good climber, strong on the flats and fast in a sprint. No one knows how to win from a breakaway better than Sanchez so if he joins the right break, he will be the man to beat. Battaglin is not the only Bardiani card. This is Sonny Colbrelli’s final chance to win a stage in this race and he will be eager to make the most of his opportunity. He may not be at his 2014 level yet but he has been riding solidly in this race. The climb will be too hard for him to go on the attack but if the break still hasn’t gone clear after the summit, he will be ready to strike. It will be very hard for anyone to beat him in a srint from a breakaway. Giant-Alpecin will be riding for Mezgec but like Trek they may choose to send a rider on the attack if the situation gets out of control. Their man for the breaks will be Simon Geschke who has been getting better and better in this race after he missed the spring season due to a broken collarbone. Geschke is strong enough to be in the mix in the first part and like out other stage winner picks he is fast in a sprint. Sylvain Chavanel was not in his best condition at the start of this race but he has been getting better and better. His performance in the time trial suggests that he is now close to his highest level. If that’s the case, he will be a contender in a stage that suits him perfectly. He is powerful on the flats, strong in this lumpy terrain and reasonably fast in a sprint. Finally, he has a vast experience that will allow him to outwit his rivals in a breakaway. 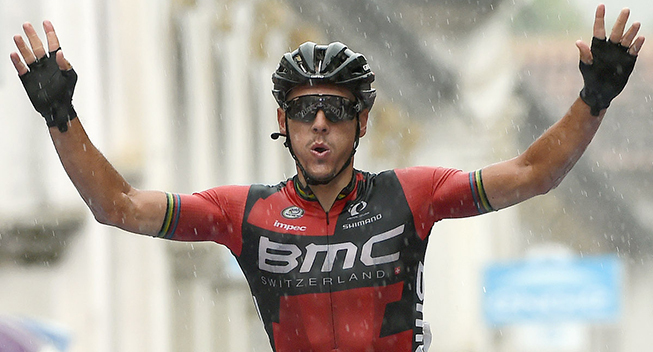 Diego Ulissi is another stage winner in this race and he is still eager to add to his tally. The Italian was targeting the stage to Monte Berico but came up short after he had to chase back after having been held up by a crash and set back by punctures. He has admitted that he now has to ride aggressively to find an opportunity in the final part of the race which doesn’t suit him very well. This stage could be his best opportunity. He is clearly not in his best condition yet but his performances in stages 7 and 12 clearly indicate that he is getting better. He is a good climber who should be able to get into the break and he is fast in this kind of finale. The main issues are whether Lampre-Merida will allow him to attack or focus everything on a sprint finish with Sacha Modolo, and whether he is still fresh enough to be a contender as he seemed to suffer a bit in the recent mountain stages.